Steve Rasnic Tem writes like a free man. That is the simplest way I can say it. Previously, I had read a handful of short stories and knew I wanted more of Tem’s perspective. In the last few months I have read two novels and a collaborative novel written with his wife Melanie Tem. You can find their joint website here. I started with the collaborative novel. The Man On The Ceiling was originally released as a novella that went on to win a World Fantasy Award, Bram Stoker Award and an International Horror Guild Award in 2000. The version I picked up was the expanded novel released by Wizards Of The Coast Discoveries. It is part biography, part fiction and as the authors remind us frequently all of it is true. I believe them. The surreal emotional dread is authentic. The fluidity of imagination and jagged reality is handled so well, it’s perhaps the thing that best represents what kind of writer Tem is. The visceral fear he strips naked is rooted in parental anxiety. Our inability to protect that which is most important turns to poison with the glide of a shadow on the wall. Imagination, fear, disaster fantasies and unconditional love wrestle on the cliffs of psychosis when one is open to feel all that there is to feel. 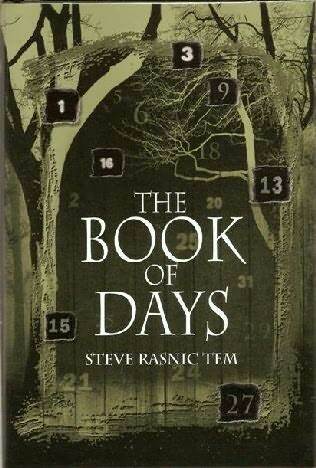 Next I went to The Book Of Days, published by Subterranean Press. The tale again deals with the theme of parental anxiety and personal insecurities. The protagonists flees his family to his familial cabin in the woods. What follows is a tale told in the framework of a short story every day as the main character struggles to fend off madness. This set up allows Tem to rip wide his vivid perspective on the nature of pain. All the horror in the world is just behind your eyes. Finally, I just wrapped up Excavation released in eBook format by Crossroad Press & Macabre Ink Digital, 0riginally released in 1997. Parental anxiety again plays a role in his tale of a man who returns to the isolated coal mining town where he grew up. The town suffered a flood that killed his family and numerous others after he left, but the sickness and rage that led him to flee that life is right where he left it. That Tem can write about such personal, crippling fear with such freedom of ideas is perhaps my favorite quality in his inspired work. I don’t get a sense of self consciousness in the writing despite the self consciousness and, arguably, even narcissism of his protagonists. He goes where the trapped and paranoid mind goes. Tem has countless short stories out there as well. With any luck a big, fat collection is forthcoming from somewhere (I haven’t seen any indication of that though). Centipede Press recently released a collection of all of Steve and Melanie’s collaborative fiction titled In Concert that I hope to get my hands on before too much longer. He’s a writer with enviable skills. If you enjoy emotional, psychological prose that slithers between boundaries into the overlooked crevasses of our internal reality Steve Rasnic Tem is probably for you.It’s been a true pleasure and inspiration to explore his work. This entry was posted in Books and tagged Crossroad Press, Excavation, Horror, Macabre Ink Digital, Magic Realism, Melanie Tem, Steve Rasnic Tem, Subterranean Press, The Book Of Days, The Man On The Ceiling, Wizards Of The Coast Discoveries. Bookmark the permalink.